In this guide, we’re going to review compact dryers that have less than 5.0 cubic feet of drying capacity. We chose that size since most manufacturer’s simply don’t list larger than 5.0 CuFt dryers as “compact” and larger models could hardly be considered compact. Dryers are often categorized by the volume of the drum, the width of the dryer, or by the maximum weight of clothes you can fit in a single load. We’re going to take an in-depth look at the features and performance differences between the various types of 110V compact clothes dryers and washer/dryer combos. Here is an outline so that you can easily find what you’re looking for. How Do 110V Dryers Perform Compared To 220V Dryers? Here we’ve selected the most highly-rated dryer models from the different size categories. 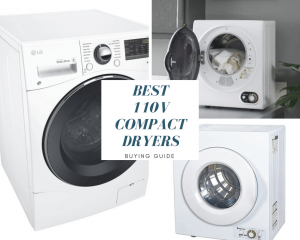 If these don’t quite fit your needs, then check out the Dryer Comparisons and Reviews section below for more of our recommended 110V dryers and washer/dryer combos. 4.3 Cu. Ft. 5.98 Cu. Ft. 9.46 Cu. Ft. 10.02 Ct. Ft. 11.8 Ct. Ft.
1.5 Cu. Ft. 2.6 Cu. Ft. 3.5 Cu. Ft. 15 lbs Wash / 11 lbs Dry Capacity 2.3 Cu. Ft.
You’re in a small apartment or have limited space. You don’t have a 220V-240V outlet available. You’re looking for a dryer that will work in your RV, boat, or camper. You want a ventless dryer that doesn’t require you to exhaust the dryer outdoors. Compact dryers can fit in unconventional places, such as on countertops, under your kitchen counter, in cramped storage closets, and even mounted on the wall. Being able to plug your dryer into a standard 120V outlet means nowhere is off limits as long as you can fit the dryer. If you have limited space, you should be able to find a solution here. RV’s and boats are excellent examples of situations where you can benefit from the portability of these dryers. Smaller models can even be stored away when not in use so that they’re not in your way. Some compact dryer models come standard as ventless, which means you don’t need to vent the exhausted air outdoors. Excess lent is captured by a filter that you must clean often. Inevitably these models do produce heat and are similar to having an 800 to 1500W space heater. More on this in the About Ventless Dryers section below. 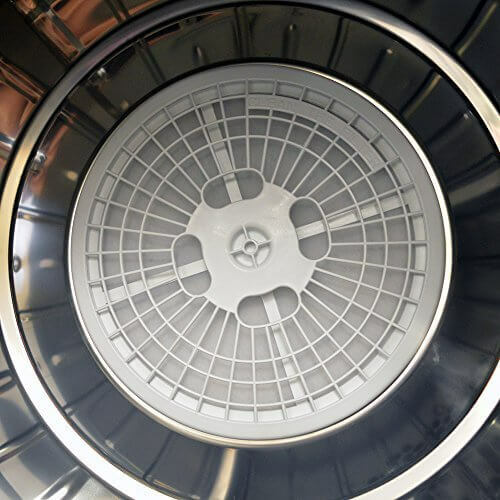 Before we dive in, it’s important to understand the electrical requirements of the dryer your buying as well as the electrical capabilities where the dryer is being installed. The most common voltage found in U.S. households is 120V, but we often have 240V (often called 220V) plugs in our laundry rooms for our clothes dryers. The current requirements are also critical as most 240V outlets can handle up to 30 Amps, while 120V plugs are usually on a 15A breaker circuit. Of course, the subject of this article is compact dryers operating in the 110-120V range. Make sure you’re not plugging your dryer into an outlet on the same circuit with other high-current appliances. A higher voltage means that a lower current is required to transmit the same amount of power. Your electric bill is based on kilowatt hours. A kilowatt-hour (KWh) costs the same regardless of voltage, so there is no difference in cost between 110VAC or 220 VAC. A 110V/15 Amp rated dryer will take longer to produce the same amount of heat as a 220V dryer on a 30 Amp circuit. To expand on the last point, this isn’t as bad as it sounds since we’re concerned with compact, low-capacity dryers. Large 7.0 or 9.0 CuFt capacity dryers would be horrible with low voltage and current, but the compact dryers we’re looking at here are in the 1.0 to 4.75 CuFt capacity range. That’s much more reasonable. To summarize, while compact dryers aren’t any more or less expensive concerning energy costs, they do require more time to perform the same job as a 220-240V dryer. There are a couple of caveats about ventless dryers due to air quality and safety considerations. Gas dryers cannot be vented indoors. 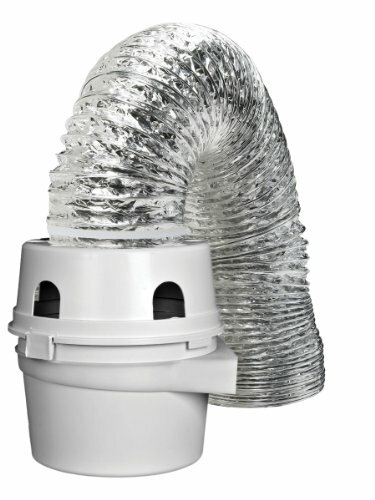 You can buy indoor venting kits for dryers that aren’t technically “ventless,” but gas dryers cannot be vented indoors. More information on these indoor venting kits can be found below. 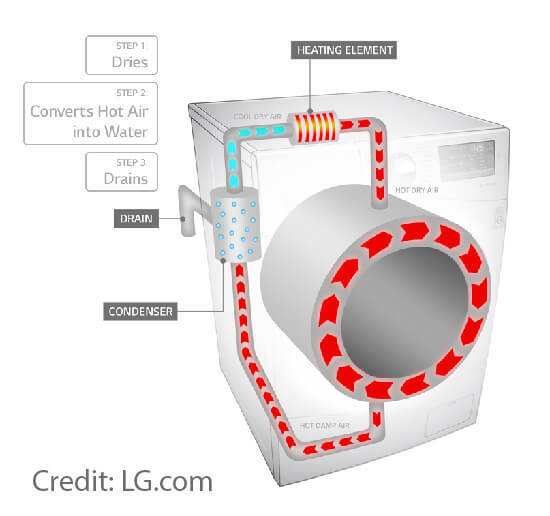 The diagram above is an illustration by LG of how one of their ventless All-In-One Washer/Dryer models functions. This particular diagram shows a condenser on the dryer with a drain for catching excess water. Most compact dryers are just like traditional dryers and do not have a condenser, but instead simply release the air back into the room. At first it may seem like a hassle that you have to deal with the water drainage, but the alternative is the dry outputs hot, humid air. For compact dryers, this is still a mild inconvenience, but due to the small load size and relatively low heat, it is bearable. The smaller the dryer, the less heat, and humidity you will deal with. As always, there are tradeoffs with the convenience of a ventless dryer. Most compact ventless dryers have a filter like the one shown below. It’s inside the drum and acts as an exhaust filter to minimize the dust and lint that gets exhausted back into the air. These filters will need to be cleaned after just about every load. If you want to be really careful and make sure you’re not releasing lint into your home’s air, then buy an additional indoor dryer vent attachment for extra filtration. We’ve got a few models shown below that will work with any dryer. The BetterVent model is attractive if you don’t want to deal with adding water to the lint trap, as it’s merely a set of filters for the air to pass through. You will need to clean out the filters after every one or two loads. The Deflecto and Dundas models use a reservoir of water to trap lint. After every one or two loads, you will need to add water and possibly clean out the trap. Does not use water. Double filter system. Needs to be mounted vertically on wall; parts are included for installation. Uses water to capture lint. Transition duct, 2 clamps and lint trap are included. Vertically mount on wall; parts are included for installation. Uses water to capture lint. Includes 5 feet of 4″ diameter transition duct, plastic lint reservoir, 2 adjustable clamps. Remember, these types of attachments do not get rid of the heat. If you live in an area with hot summer weather, then consider getting a dehumidifier to keep in the same room with your ventless dryer. Obviously, the smaller the dryer and the shorter the length of your drying cycle the less heat and humidity you will have to deal with. We’ve grouped the dryers by the capacity of the drum. This measurement is usually provided by the manufacturer. We also like to consider the total volume of the body of the dryer, which gives you an indication of how much space it will occupy, but you will undoubtedly want to check the exact dimensions to make sure the dryer fits your room. We also multiply out the dimensions of the dryer to get a single number, the volume (called Body Volume in our tables). Instead of comparing each individual measurement, you can get an idea how the different capacity dryers differ in size at a glance, though you should base your final decision on the exact dimensions of the dryer. You might notice there are dryers with the same width that have a substantial difference in drum capacity. That’s due to either the height or depth of the dryer being larger or smaller. This is great since you have a ton of options that might fit in unconventional spaces and provide more drying capacity than you expected. Additionally, we chose to look at the total volume of the dryer body because some compact dryers aren’t necessarily less wide than conventional dryers, but occupy significantly less space due to being shorter in height or depth. With the total volume, we can at least get a simple number to indicate the compactness of the dryer. The larger the overall dimensions of the dryer, the larger its capacity. Taking measurements of the area you’re going to install the dryer is your first task. Keep in mind the pipes and hoses as well. Generally, the standard exhaust vent is 4 inches in diameter. Don’t forget to leave room for the door to open and close! Capacity can also be shown in terms of the weight of the wet clothes being loaded. We include the drum volume when it’s provided by the manufacturer’s specifications, but if we can’t find documentation, we will include the clothes weight if it’s provided. If you’re considering a washer/dryer combo model, then keep in mind that they’re usually larger than a standalone dryer or washer. Among washer/dryer combos and the standalone dryers within the same capacity range, we typically see the height and depth (how far it sticks out from the wall) being the dimensions that account for their larger size. Once you pick a width that you can work with, start looking at height and depth. There aren’t a ton of options in this size category, but these models have all the essential features and support ventless drying. Only the Panda comes with the ventless kit, but if you prefer the other models, the kit can be purchased separately. Overall we think the Panda is an excellent choice for the 1.0+ CuFt category. 19.5" x 16.1" x 23.8"
19.5" x 16" x 23.8"
All three of these models operate at the same wattage and can be vented indoors. In addition to the lent filter, there is an exhaust filter that must be cleaned as well. The exhaust filter helps make sure no lint makes it out of the dryer if you’re venting it indoors. The heat generated by these models is similar to a small space heater of similar wattage. It’s not too uncomfortable, and indeed is significantly less heat than a standard, full-size dryer. You can expect full loads to take one and a half to two hours to completely dry, but this depends on the temperature setting you use, type of fabric, and wetness. The dry cycle settings for all three models are essentially the same. You get 4 different temperature settings with an adjustable timer. 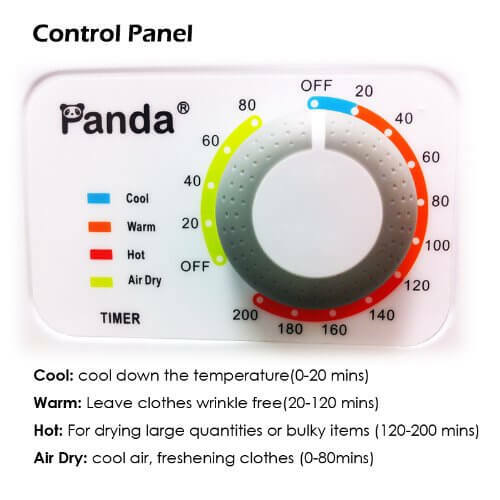 The times shown above are the timer settings you’ll want to use when drying a load to achieve the desired temperature. There are warmup and cooldown periods, so if you’re going to dry a load in an hour, you will want to set it to one of the higher settings to make sure it dries at a hotter temperature than if you had just set the timer to an hour. This is based on user feedback, and you will want to try different settings depending on the type of laundry you’re drying until you’re comfortable with it. If you have space, jumping into the 2.0+ CuFt category is recommended. You won’t want to get the smallest possible dryer, but instead, see how much you can squeeze into your space. 23.6" x 17.1" x 25.6"
24.88" x 16.75" x 27"
The Magic Chef model comes with the wall-mount kit and ventless drying kit and is very affordable. Though it isn’t a substantial difference, the Magic Chef is also the smallest regarding overall size of the dryer, but still maintains the same drying capacity as the Panda and Haier dryers. The features and settings on these three dryers are almost exactly the same; however, the Haier doesn’t have an adjustment knob for the timed dry and instead has 5 different pre-programmed times. It may not be evident until you actually have one of these compact dryers in front of you and you start loading it that you realize how big the jump from 1.5 CuFt to 2.5 CuFt capacity really is. Drying large blankets is impossible for smaller dryers. Just to reinforce what was stated above, if you have the space to spare then get the largest compact dryer you can reasonably fit. You’ll be thankful. 23.6" x 21.5" x 32.2"
23.6" x 21.2" x 26"
23.88" x 20.75" x 32.5"
23.62" x 21.44" x 32.45"
23.75" x 22.5" x 27"
At the time this article was published, the Whirlpool model wasn’t available from Amazon, so we recommend comparing prices with Jet.com or other retailers. It’s an excellent model that’s highly rated and comes from a well-known brand. It’s also popular with RV and camper owners. Magic Chef is another well-known brand that we feel comfortable recommending due to their customer support. Concerning quality and features, we think the Magic Chef wins overall here. The included mounting brackets are helpful for people looking to take advantage of vertical space. 10.02 Ct. Ft. 10.2 Cu. Ft. 10.17 Cu. Ft. 11.8 Ct. Ft. 17.98 Cu. Ft.
15 lbs Wash / 11 lbs Dry Capacity 15 lbs Wash / 11 lbs Dry Capacity 2.0 Cu. Ft. 2.3 Cu. Ft. 4.3 Cu. Ft.
One of the great features of most washer/dryer combos is that they have a built-in condenser. 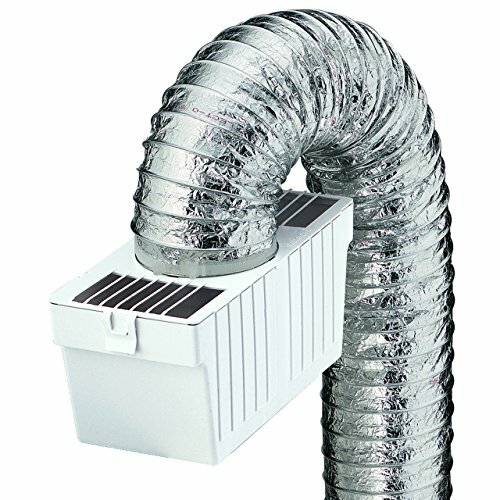 This means you can use it like a ventless dryer, and not have to deal with hot, humid air being exhausted into the room. This results in using a drainage pipe to collect the condensed water. You may be able to connect it to your sink or a drainage connection depending on where you install it and if your home or RV has that capability. As you can see, the overall size of a washer/dryer combo is large than a similar capacity standalone washer or dryer, but that’s not surprising. Splendide is a favorite brand for campers, RV’s, and boats. 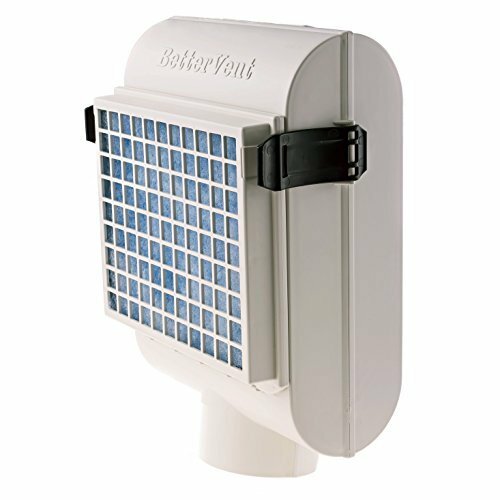 Getting the ventless model is highly recommended, as it’s much easier to dispose of the water than to deal with hot, humid air exhaust. 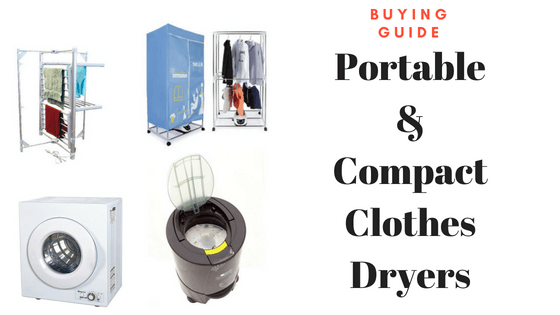 Check out our portable and compact dryer buying guide for more information.